Games2win’s #1 flirting game is now available on iPhone, iPod Touch and iPad for FREE! 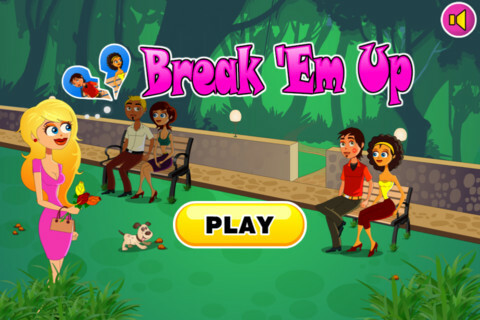 Break Ém Up is one of the most popular games on www.games2win.com, with 1.5 million plays! You play as a girl in search of Mr. Right. Sadly, all the good men are already taken. Take them back! Make sure to evade the prying eyes of their girlfriends or learn to stay single! Go ahead and unleash the seductress within because all is fair in love and war! Don’t go around looking for Mr. Right… Just steal him! – Quick, Snacky Gameplay – Pick up and play a level whenever you have a minute or two to spare! – Avoid the pervy old man, put him in his place! Time to go on a flirting spree and steal boyfriends everywhere! Click here to download the app today!